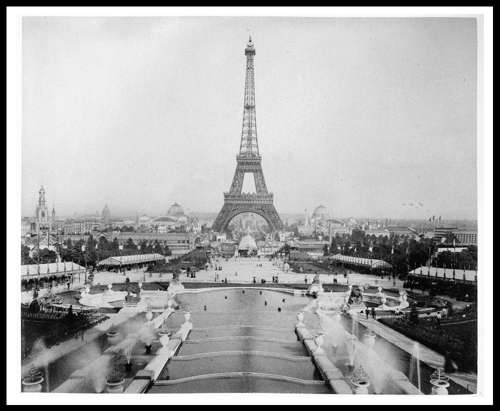 After the Paris Exposition in 1889, America wanted to show that they could produce a fair that was even more grand. Even Eiffel's tower, forecast by wishful Americans to be a monstrosity that would disfigure forever the comely landscape of Paris, turned out to possess unexpected elan, with a sweeping base and tapered shaft that evoked the trail of a skyrocket. This humiliation could not be allowed to fanned patriotism to a new intensity. The nation needed an opportunity to top the French, in particular to 'out-Eiffel Eiffel.' Suddenly the idea of hosting a great exposition to commemorate Columbus' discovery of the New World became irresistible. In order to "out-Eiffel Eiffel", George Ferris decided to build a giant wheel that would spin and allow visitors see the whole fair. At first the Exhibition's planners were skeptical of the design, but in the end Ferris was able to convince them that the wheel was buildable and safe. When the World's Columbian Exhibition of 1893 was being planned in Chicago, the 33-year old Ferris arrived hoping to help build a structure to outdo the Eiffel Tower, the centerpiece of the Paris Exhibition of 1889. The Exhibition's planners wanted something "original, daring and unique." Inspired, Ferris sketched a huge, revolving "observation wheel" on some scrap paper that same night, in detail down to the ticket price. The next day, he presented his idea to the committee. They had heard of the smaller, wooden "pleasure wheels" that had begun to appear at various vacation spots about twenty-five years before; but, seeing the sheer size of Ferris' wheel, the committee dismissed him as a crackpot. A few weeks later, Ferris returned to the committee. He had convinced several fellow engineers to endorse his structure as both buildable and safe; more importantly, he had found local investors to cover the $400,000 cost to construct. This time, Ferris' plan was approved. The Ferris wheel was a success at the fair. It was able to withstand the Chicago wind and make a profit of $750,000. Ferris' innovative design, a model of efficiency, let the wheel withstand Chicago's infamous winds while being able to hold about five times the 1,200 tons that it did carry fully loaded. At its opening on June 21, 1893, the Ferris Wheel became the irresistible centerpiece of the Exhibition. As one reviewer put it, "You cannot advertise the wheel, anyway, any more than you can advertise the fair, or the Atlantic ocean. They are all too big."